The Birth Plan Debate: When Did It Become Us Vs. Them? : The Baby Project Lateefah Torrence says the last time she went to her dentist, she didn't tell him what tools to use or how to replace her filling. The rules seem to change, though, when a woman is having a baby. She's trying to walk the line between annoying know-it-all and clueless mom-to-be. Lateefah and her husband, Frank, during a visit to his classroom earlier this month. It took them a while to find their OB, but they're thrilled with their choice. I am nearly 40 weeks pregnant, and I just gave my OB our birth preferences sheet. As I have mentioned before, most of the decisions of this pregnancy have been fraught with worry, but our birth plan is one of the few items that involves other people. Lots of other people. Before my pregnancy, my beloved and longtime OB/GYN stopped taking insurance of any kind. I continued to see her, paying out of pocket. Without the overhead of an insurance bureaucracy, her rates were quite reasonable. I could pay with pre-tax dollars from our flexible spending account, and my visits were only once a year. She assured me that when I did become pregnant, we could work out a payment plan and that my insurance would likely reimburse us with about two-thirds of her charges. This would hurt our savings account, but it was doable if my delivery was textbook. But what if it wasn't? I didn't want to be wheeled into the OR while calculating the cost of each suture. Although I would miss my doctor's rare mix of frankness and warmth, I knew I had to let the relationship go so that I could be focused on a healthy birth instead of the tab in my head. And so the search began. I cross-referenced recommendations from friends, our neighborhood parents' listserv and opinions from online sources like UrbanBaby.com (while ignoring the more vicious posts at that site). After eons of research, I picked a new OB/GYN at the world class university medical center down the street and tentatively made an appointment for my annual exam. It was glorious. I immediately fell into an easy report with Dr. A. She sat down and took the time to speak with me about my concerns, my miscarriage, the possibility of fertility treatment, and what our next steps could be. I couldn't believe it had been that simple. What had I been worried about? When I became pregnant again and it was time to make the momentous first appointment, I happily called Dr. A's office — only to be told that my new love was no longer practicing obstetrics. I was referred to another doctor in the practice and scheduled an appointment with Dr. X. Her name was familiar, as many of the doctors in the practice were highly regarded, and I didn't have the will to start the search over again. 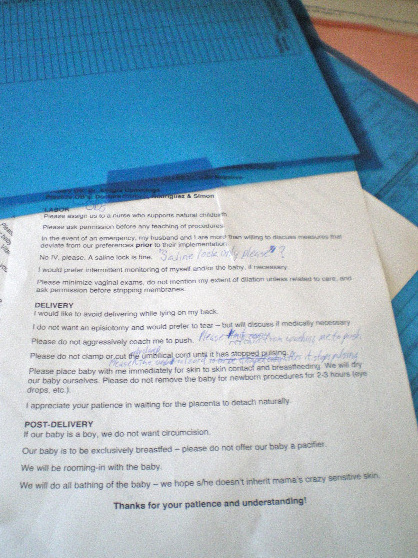 Because this is a blog and not a novel, let's jump ahead to the appointment: Dr. X takes my history, admonishes me about something or other, and when I ask about the possibility of a "natural" birth, she states: "When you get to the hospital, you will be put on an IV and monitors and put in the bed. You won't be able to walk around or ..."
That is all I needed to hear. She was very clear that her approach and the hospital's approach to birth was highly medicalized, and I knew there would be no need of a second date. I am a first-time-mom, and I am trying my hardest to walk the high wire between being an annoying know-it-all and being the clueless woman who simply shows up at the hospital when her labor begins. But when did birthing babies become so fraught? Although my state is not particularly friendly to midwives and home births, I did consider it. The idea of being in my own territory, without the constant buzz, beeps and chemical smell of a hospital is incredibly soothing. In the American history of birthing, hospital births are an anomaly — I just don't want to deal with the mess. But seriously, if something were to go wrong at home, I would never forgive myself. (This is a statement of my own wonky psyche, not a condemnation of home births.) Also, as an older mother with abdominal scar tissue from a near-deadly bowel obstruction, a home birth simply wasn't feasible — for me. Initially, I chose the local university hospital because of its high-level NICU. I hoped that we wouldn't need it, but it was soothing to know that it would be there if we did. But after meeting with Dr. X, the reassurance of the NICU didn't outweigh my fears of what many call the highly medicalized birth "cascade of interventions": drugs given to speed labor, followed by narcotics to ease the pain, which slow labor and/or put the baby in distress, which leads to a C-section. Once again, I had to find the middle path. Perhaps I should have this tattooed on my arm? And back into research mode I went. I decided to go with a hospital that is a bit farther from us, but has a reputation for supporting natural childbirth. While scouring the Internet, I stumbled across an open house for doulas held at the offices of an OB practice. I figured that any OB practice that would lend its space to doulas would be worth looking into, and I was pleased to find that the practice accepted my insurance and that the doctors had privileges at my new hospital of choice. Tentatively, I made an appointment with one of the doctors after stalking her on Google. Another first date. Another disappointment? Nope. Frank and I were immediately charmed by Dr. Y. He hadn't been quite sure why I had dropped Dr. X so quickly, but after meeting Dr. Y, Frank assured me that I had made the right decision. Lateefah's draft of her birth plan, along with other paperwork she and her husband have to bring to the hospital. 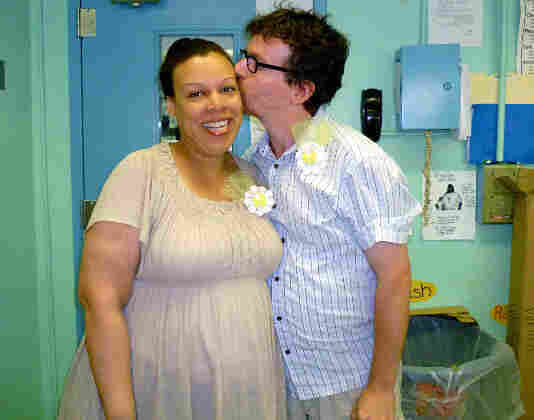 Through nearly half a year of appointments, Dr. Y has gently guided us through my pregnancy. She fully supports natural childbirth, is easily available via email, and spent an inordinate amount of time showing off our dancing babe on the ultrasound when my mom was in town for my baby shower. So why was it so hard for me to hand her our birth plan? Because I have built a relationship with Dr. Y, and giving her a sheet of instructions felt like I was telling her how to do her job, and I know I would be insulted if someone did the same thing to me. I know. I know. The plan is not just for my OB (who may not even be on call when I go into labor). It is also for the nurses and any specialists we may encounter. However, bringing babies into the world is what these people do for a living. They hold advanced degrees. They have years of experience. What do I have? A couple of books and far too many hours on the Internet. Yet, I also know that these medical professionals work in a system they have little control over. We've all read about the high cost of malpractice insurance. And who doesn't have a story about fighting her insurance company to cover a necessary procedure? How do I respect their expertise while protecting myself from a structure that may not have my best interests at heart? Also — is this something I truly need to worry about? Perhaps I'm reading too much into it, and maybe it doesn't exist in life outside of the Web, but it seems to me that some groups are feeding an odd layer of animosity between mothers and the medical birthing community. The last time I went to the dentist, I didn't tell him what tools to use or how to replace my old filling. Yet, as an educated woman, I am expected to tell my doctor how to bring my baby into the world: no episiotomy, don't make me push on my back, leave the umbilical cord until it stops pulsing, etc. Is it me or have we come to a place where it is assumed that most obstetricians are more interested in the speed of birth than the quality of the experience? Thankfully, Dr. Y graciously accepted my birth plan and told me it was the best she had ever seen. Perhaps it is time we turn the dialogue into how to support best practices across all choices in birthing, instead of seeing it as us against them. Editor's note: Lucy Peck wrote recently about her plan for a natural childbirth. You can also read about Sarah Crossman and Loriani Eckerle's birth experiences — neither of which went as planned.